A tall mysterious man in a green hat and suit with a mission, to make people who love to play online feel welcome into his exciting world. Mr Green is an online casino that prefers to call them a family. They mean that when you become a member at the site you immediately become a part of the Green family forever. They want it to be like in a real family where you take care of each other. Mr Greens way of showing that they care about you is that they value that every player has fun while they are playing and only play as much as they can afford. It’s a campaign they call “green gaming” and it is constantly operating. The site opened 2008 and has in a few years grown to become one of the strongest competitors on the market. Six years in a row they won best online casino and if that doesn’t make you want to try out this site we don’t know what is wrong with you! Mr Green has a Green Gaming Policy which allows you to decide how much you want to deposit, loss and wagering limits for a time period. You decide for yourself if it’s daily, weekly or monthly. With this system you can easily control your gaming and how much money you want to spend. It is part of Mr Green’s way of taking care of their family and making everyone feels like they are in control and safe at the casino. It depends on where you live what kind of welcome bonus you receive. Of course we have made a bonus link for you to use at Mr Green. If you use our link you will get 20 extra spins with no deposit in the exclusive slot Mr Green Moonlight only by registration. You can also get 100 bonus spins if you make a first deposit of 20 GBP or more. The first deposit also has a 100% bonus connected to it. To claim some extra spins you could also choose to follow Mr Green on their Facebook page. From time to time they have some giveaways if you participate in their competitions. Until now they have had some questions and you only have to comment your answer and your user name so they know who they are going to give the extra spins. An example taken from their page was this question “It’s Friday the 13th, a day of superstition and myth. What’s the strangest superstition you’ve heard of?” The top five comments got themselves some extra spins. As you can see it sometimes isn’t that hard to get them extra spins. A tip is to follow the Facebook page and never miss the chance to get extra spins. Don’t forget to use our link to get your extra spins! Significant terms: 18+. New UK players only. 20 Free Spins on sign up. Deposit Bonus: 100% up to £100 Bonus + 20 Bonus Spins, on each of your first 4 deposits. £10 min deposit (Skrill, Neteller excluded). £5 min. wager to activate Bonus Spins. All spins are valid on Book of Dead and expire after 7 days. 35x wagering on eligible games (£5 max stake) before Bonus, Free Spin or Bonus Spin winnings can be withdrawn. Eligibility restrictions apply. Please play responsibly. BeGambleAware.org. Mr Green offers a lot of bonuses and promotions for their players. We have mentioned the Facebook page already but it’s not always extra spins that they give away, an example of what they have given away is exclusive Mr Green cufflinks! Are you a true Mr Green player that wouldn’t be so bad to win? But bonuses aren’t so bad that either and every week you have something to look forward to in this casino. At the promotions page you can check out all the offerings and see if there is something that suits you for the moment. Special occasions like, holidays and game launches online are often celebrated with some great offers. But you can also get a special invite from the casino to participate in a contest or join the party, which often means that you have gotten some prize in your account. So don’t forget to check your account and inbox so you never miss an invite. All bonuses comes with the MrGreen Terms and conditions, and is for 18+ only. At the casino there are a lot of slots to choose from. All the slots have different themes and some of them include things like jackpots, bonus games or special wild symbols. The games come from some of the best game developers in the game industry. You will find games from both Betsoft Gaming and International Gaming Technology. Mr Green is as we mentioned a very mysterious man, but with an aura of a gentleman. You can find out yourself in a slot called “The Marvellous Mr Green” in the slot you will step into his world. The gentleman is a remarkable and extraordinaire maestro and in the slot you will find that every spin is pure delight. Except for this slot the casino has two more slots at this time that are exclusive for them. Mr Green has won a prize for best online casino six years in a row and 2012 they also joined the mobile market. With the six prizes there is no surprise that they also chose to join the mobile market. 2016 they received two awards for their mobile casino, best app and best mobile casino. The app has over 300 games in it which make the experience as good as on the computer. The app is both suitable for iPhone and android systems. The only thing you need to start playing is a smartphone or tablet, internet and to download the app. If you prefer you can play by using a web browser also but everything is easily accessible through the app. Sometimes there are also some exclusive offers for members who use the app. If you’re not a member on this mysterious site yet it’s time! The support from Mr Green comprises of live chat, email and a telephone number. The live chat is available 24 hours a day and 7 days a week which is really good. We appreciate companies that have these opening hours just because we know that many players often play at casinos during the evenings and nights. The agents at the support are friendly and that is also something that we cherish. They may not answer within the minute but they have a really nice attitude against you and really want to solve your problem. The payment solutions that are available on Mr Green are Visa or MasterCard and three of the most common e-wallets; Trustly, Skrill and Neteller. To withdraw money goes really fast and they want you to have your money within 1-2 days. To think about is that they have a limit on the lowest withdrawal and by using VISA or MasterCard you may have to verify who you are before your withdrawal is approved. The verification is for your safety so that no one will be able to steal your identity and withdraw your money. It is great that casinos work to making you feel safe there. When it comes to the deposits there is a fee of 2.5% when using VISA or MasterCard, but the other ones are free. Take part of some March moolah at MrGreen this month. Collect entries to the big draw, and win a share of the £3,000 cash prize pool! 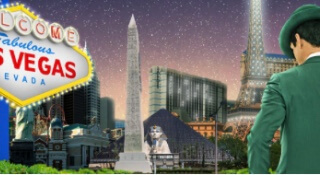 MrGreen Casino is celebrating its 10th anniversary this year - and of course you're invited! Play at the chosen Live Casino tables for your chance to win one of the two grand prizes - a trip for two to Las Vegas! £75 000 are waiting to be raided! 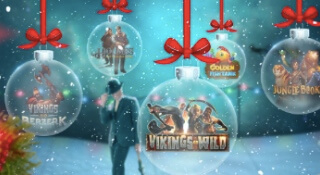 Join MrGreen Casino for your share of some great cash prizes - just in time for christmas! 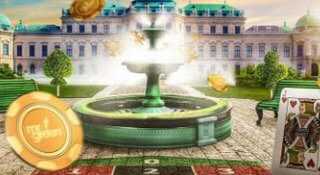 Since the beginning of 2013 Mr Green also offers Live Casino. With their reputation in the industry it most certainly was about time that happened. Today they offer four different kinds of games, Black Jack, Roulette, Baccarat and Hold’em. The dealers are friendly and you can choose both English and Swedish speaking dealers. Some people think that Mr Green really took their time before they launched their version of live gaming. But we can only believe that they really have put some effort in creating these games for the players. A special thing about their game Hold’em is that most casinos don’t offer it. The Hold’em shares it name with the popular card game but this online version is a bit different. Here you play only against the dealer and therefore doesn’t have to think about the rest of the players around the table. You can focus on only the dealer and have a nice time with the rest of the players around the table. Otherwise the game is exactly like the traditional game of Hold’em with the five cards on the table and two cards on your hand. To play live casino is the closest you can come to the feeling of being at a real casino and we highly recommend you to try it out. While you play you can talk with the dealer through the chat which makes the experience more real. As you can read through this review Mr Green has continued to release and launch new sections to their site. Since the early 2016 the site now offers a complete sports book on their platform. Odds and live betting are now available in over 50 different kinds of sports. A few of them are football, ice hockey, tennis and rugby just to mention some. Expect for this you can use the site to check which leagues that currently are playing plus see upcoming events. The sports book has a place in the menu next to the casino lobby. Like the rest of the site and app it is easy to navigate on the sport section. The design is as well as the all the different pages in a green and pleasant layout. When adding the sport section Mr Green now offers something for everyone. For those who like everything they now have it all collected in one site, which is a smart move from the company! Mr Green is located on Malta among many other companies in the business. The gaming license is issued by MGA, Malta Gaming Authority, which ensures you as a player that the company follows the rules and regulations that are setup to offer a safe environment for costumers and players online. With the license you know that both your money and personal information is handled safely at Mr Green. Another thing that assures the success of this casino is all the awards they have been winning through the years they’ve been active. The business is big and some of the awards that they’ve earned are Online Casino Operator of the Year at IGA 2015 and at EGR 2014 when they were chosen as Casino Brand of the Year.